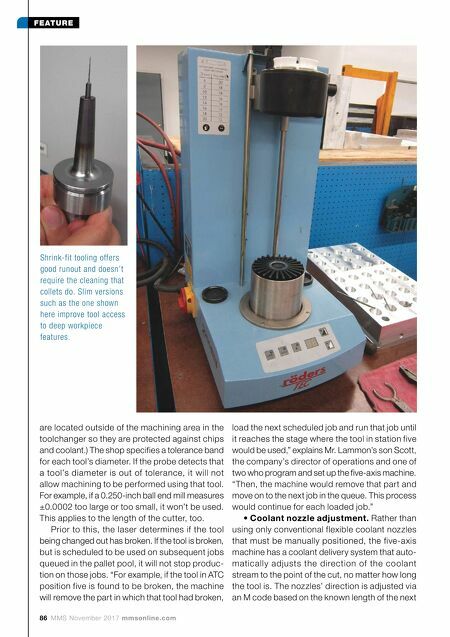 86 MMS November 2017 mmsonline.com FEATURE are located outside of the machining area in the toolchanger so they are protected against chips and coolant.) The shop specifies a tolerance band for each tool's diameter. If the probe detects that a tool's diameter is out of tolerance, it will not allow machining to be performed using that tool. For example, if a 0.250-inch ball end mill measures ±0.0002 too large or too small, it won't be used. This applies to the length of the cutter, too. Prior to this, the laser determines if the tool being changed out has broken. If the tool is broken, but is scheduled to be used on subsequent jobs queued in the pallet pool, it will not stop produc- tion on those jobs. 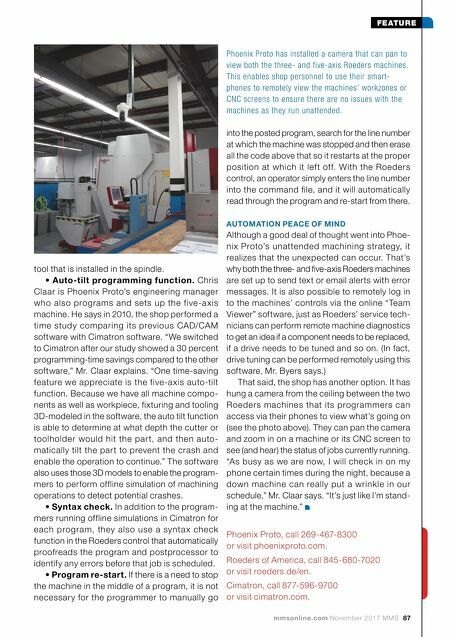 "For example, if the tool in ATC position five is found to be broken, the machine will remove the part in which that tool had broken, load the next scheduled job and run that job until it reaches the stage where the tool in station five would be used," explains Mr. Lammon's son Scott, the company's director of operations and one of two who program and set up the five-axis machine. "Then, the machine would remove that part and move on to the next job in the queue. This process would continue for each loaded job." • Coolant nozzle adjustment. Rather than using only conventional flexible coolant nozzles that must be manually positioned, the five-axis machine has a coolant delivery system that auto- matically adjusts the direction of the coolant stream to the point of the cut, no matter how long the tool is. The nozzles' direction is adjusted via an M code based on the known length of the next Shrink-fit tooling offers good runout and doesn't require the cleaning that collets do. Slim versions such as the one shown here improve tool access to deep workpiece features.